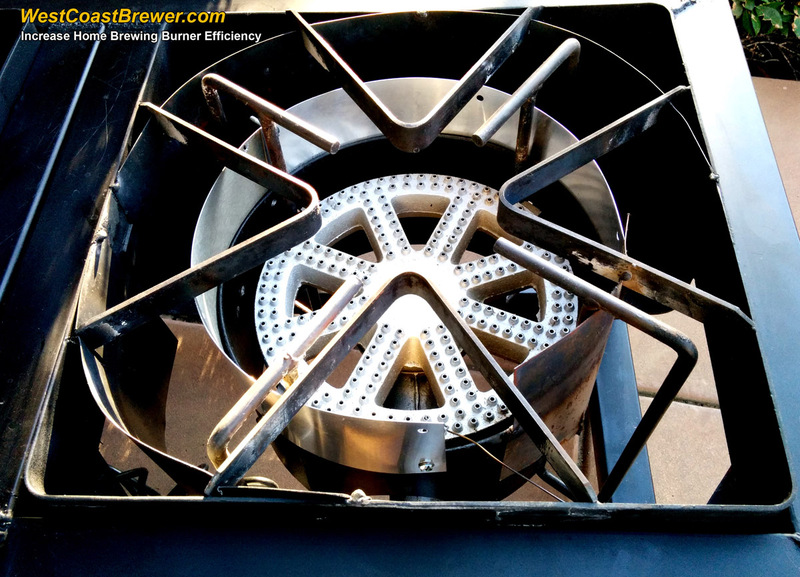 For those of you who are not familiar with RIMS, it stands for Recirculating Infusion Mash System. Basically it is a method for regulating the temperature of your mash tun during the mashing process when the grain starches are converted to sugars. The mash temperature is critical when brewing a beer and a swing of just a few degrees can have a dramatic impact on your finished beer. For instance, a mash temperature of 146F to 150F will create very simple sugars that are easy for yeast strains to convert into alcohol, providing you with a beer that has a dry finish. 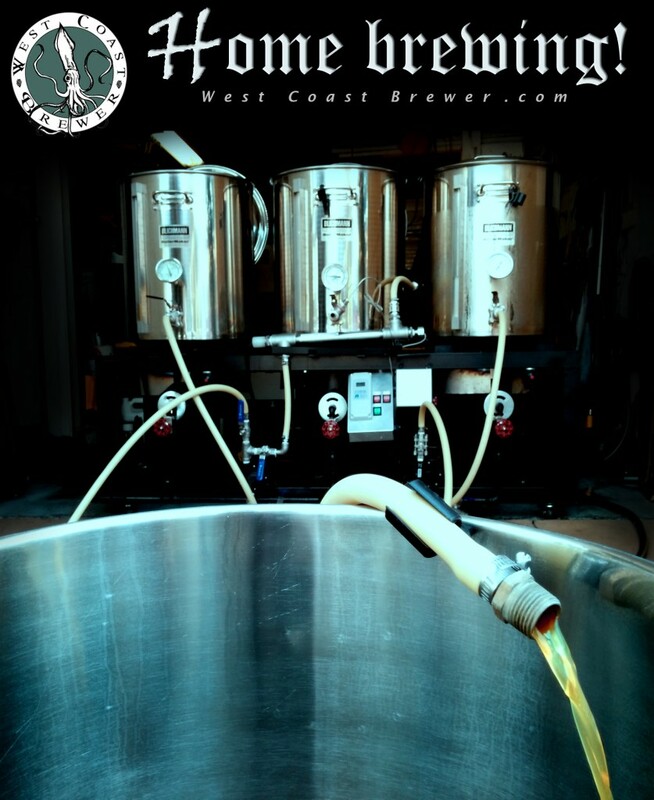 While a mash temperature of 154F to 158F will create a good deal of complex sugars that the yeast can not digest which makes for a very full bodied beer that will be lower in alcohol. 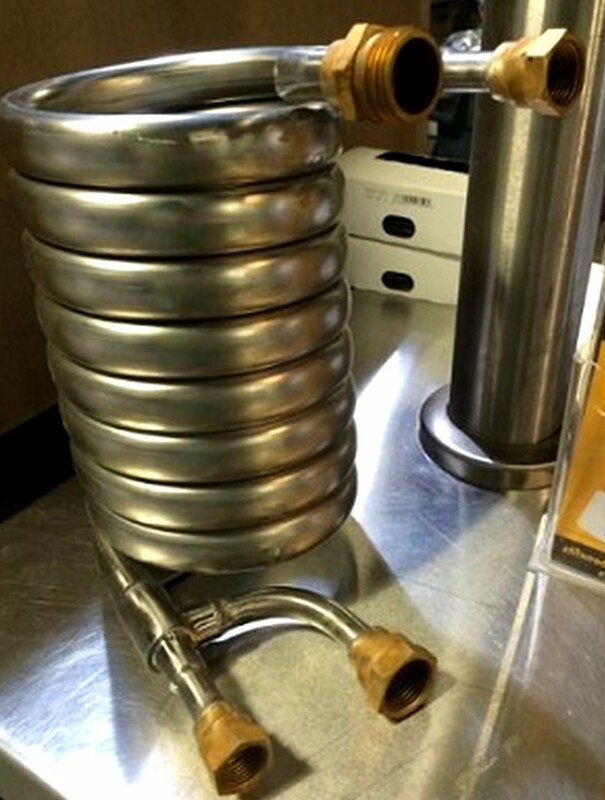 If you conduct your mash in metal kettles such as the stainless steel Blichmann 20 gallon kettles that I use, you will find that your kettles will shed a good deal of heat during the mash process. In order to maintain a proper mash conversion you will need to either heat the kettle or the fluid inside of it. 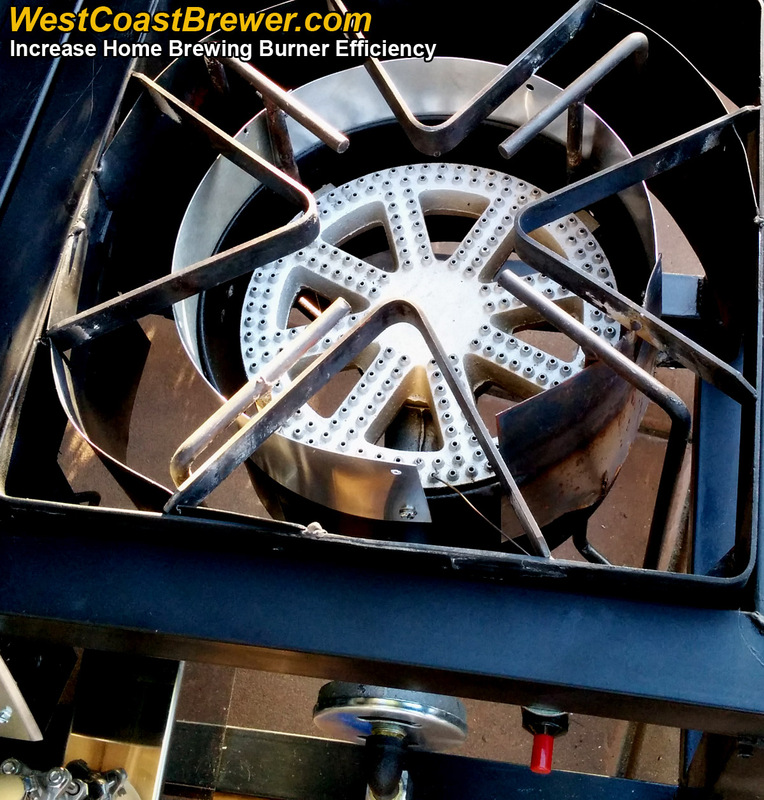 The problem with adding direct heat to your mash tun kettle is that you risk scorching your grain bed or wort and may also have a large temperature variance at the bottle of the mash tun and the top of it. 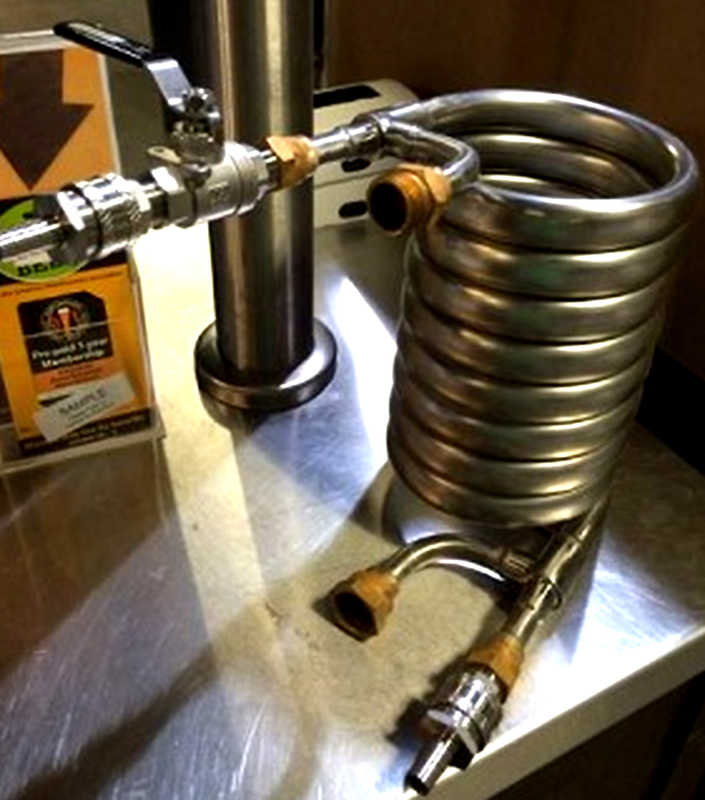 If you are going to apply direct heat, it is important that you are recirculating your wort with a pump to help minimize those issues. Another potential problem with direct heat is that it can be difficult to monitor and control with out the use of a temperature controller and means for regulating the heat source; if you are not careful your temperature can swing by 5 degrees very quickly. For the reasons I stated above, I recently started work on a RIMS (Recirculating Infusion Mash System) to help me properly maintain my mash temperature. I am still conducting tests with it but plan on brewing my first test batch of beer this weekend and am optimistic that it will work out well and help me brew the best beer possible. The system is rather simple. I am constantly recirculating the wort in my mash tun via a march pump. The wort flows into a stainless steel chamber where I have an electric stainless steel heating element at the point of entry. At the opposite end of the chamber is a thermowell that is connected to a Ranco digital temperature controller. If the Ranco temperature controller detects that the temperature of the wort has fallen below my target temperature, then it activates the low watt electric heating element until the target temperature is once again reached and then shuts the element off. The wort flows out of the chamber and back into my mash tun via my MoreBeer Ultimate Sparge Arm. Instead of obsessing over my mash temp and constantly fiddling with my burner and pumps, I can kick back, toss the football around with a friend and enjoy a cold beer until my timer goes off! It should make for a more controlled mash and less stressful brew day if all goes well. Once the design is fully tested I will submit another blog entry with more details on how to build one of your own. In the meantime, you can find Ranch temperature controllers and the MoreBeer Ultimate Sparge Arm here. 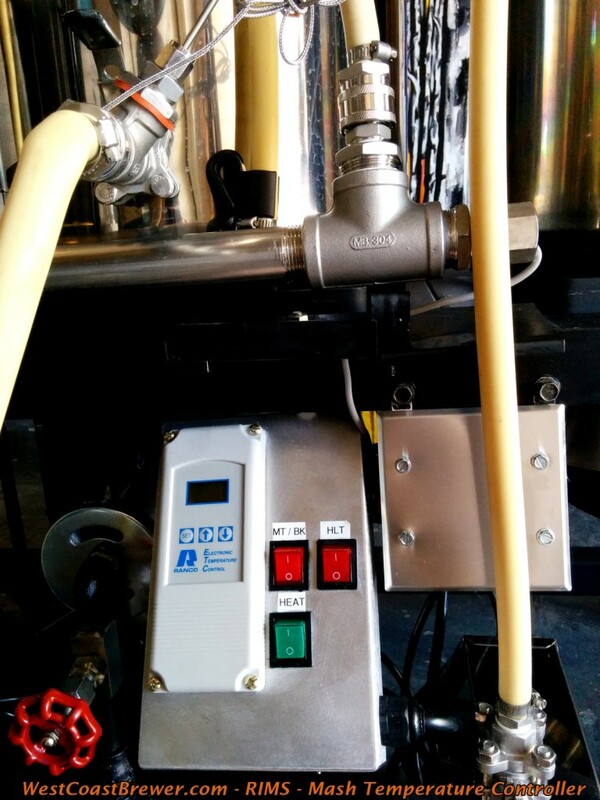 You can also select add on options for your stainless convoluted counterflow chiller including stainless steel quick disconnects and ball valves! Recently I decided that I would create a temperature controlled RIMS systems for my home brewery. 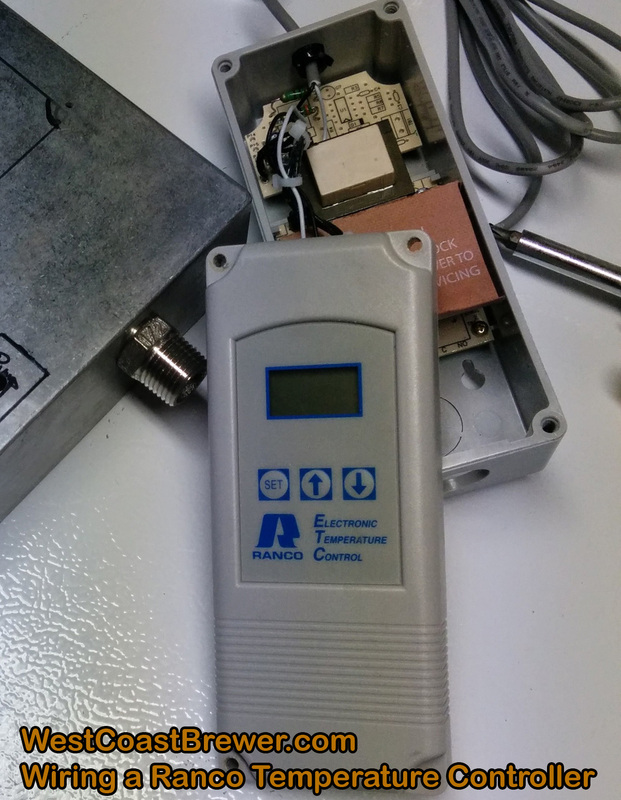 I picked up a Ranco Digital Temperature Controller (model # ETC-111000-000) to manage the temperature regulation. I have not quite completed the entire Recirculating Infusion Mash System, but I just wrapped up the Ranco wiring and thought that I would share what I learned in case it will help out anyone else. The RIMS heating element that I am using is a stainless steel 120v heating bar, so I have configured the Ranco for 120, but the Ranco thermostat is also capable of handling 240v; it just requires a slight wiring modification. I would like to point out that I am not a professional electrician. Electricity can be extremely dangerous to work with and may result in death. You should always consult with a professional electrician when attempting a project such as this. Manufacturer hardware designs sometimes change and you should refer to your instructions prior to beginning. 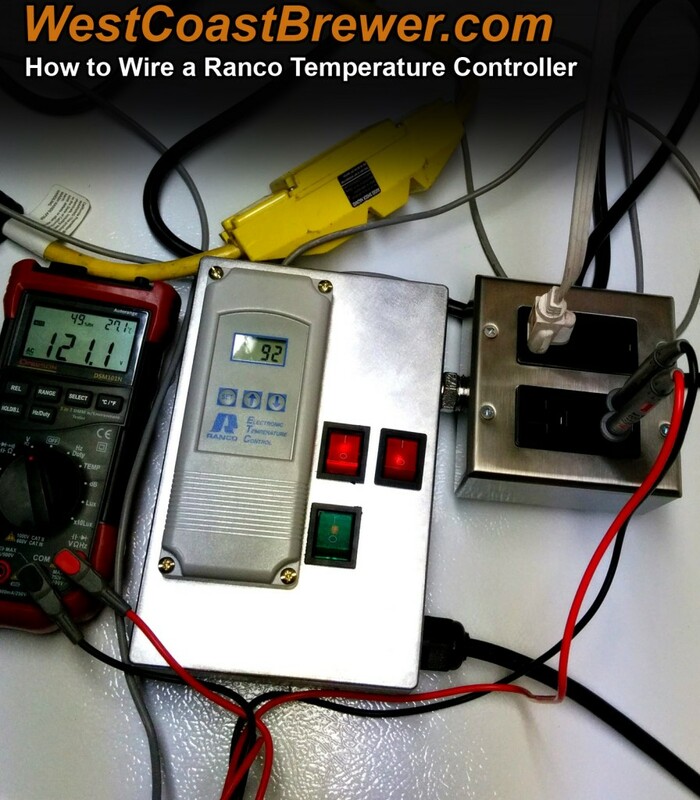 Here is a wiring diagram that I used for my Ranco Temperature Controller. I cut apart a heavy gauge extension cord to use for my wall power connection and for the wiring I used to connect to my output plug. Inside the extension cord is a ground wire, common wire and hot wire. 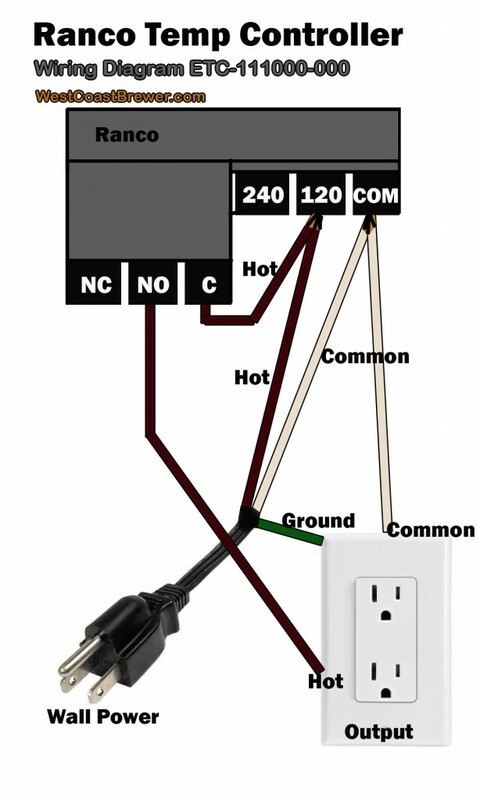 In the diagram above I use the green wire to represent ground, the white wire to represent common and the dark red wire to represent hot. Please be aware that different cables use different colored wire to represent different things, these colors are just meant to be an example. I ran the grounding cable from my extension cord directly to my output plug ground connection and also grounded it to the metal case that I am using to house my Ranco temperature controller, plug and switches. I spliced the white common cable from the extension cord and connected it to the “COM” port on my Ranco and ran an extension wire to the common connection point on my output plug. Since the RIMS heating element that I am using is 120v, I ran the hot wire from my extension cord to the Ranco “120” port. I then connected a small length of heavy gauge wire from the “120” port on the Ranco to the “C” port on the Ranco Temperature Controller. Lastly, I ran a segment of red wire from the Ranco “NO” port to the hot wire connection on my output plug. I reviewed my work to make sure that all of the wires were connected properly and there was no bare wire exposed. I then connected the device to a GFCI outlet and tested the device with a voltage meter to make sure that everything was working as intended. The Ranco is great because you can select whether you want the power to activate when the temperature drops below a certain point or rises above a certain point which means that it can be used for either a RIMS type device or to control the fermentation temperature in a freezer or refrigerator without having to rewire the device or modify the hardware. If you are not comfortable doing electrical work or if you would prefer to avoid the hassle, you can purchase a wired Ranco Digital Temperature controller. You can find several different options available here at a great price via the link below. They also have spare temperature probes and mounting brackets for the Ranco available if needed. Good luck with your project and happy brewing!